I didn't wear a cloak or carry a dagger. I didn't have a James Bonds' double-oh rating. I wore an Army uniform and used what was then state-of-the-art radio equipment for my spy craft during the peak of the Cold War. I listened in whenever the generals of the Soviet Third Shock Army in Magdeburg, East Germany, talked with their Moscow supervisors. I listened when they gave their unit commanders orders to move their tanks. I listened when their tank commanders practiced firing their big guns, or crossed rivers underwater or battened down for a simulated gas attack. And everything I did was a classified secret... and against the law. Spying on another nation's military radio transmissions was a violation of the Geneva Convention. At least I think it was a violation. They always told us it was. And they never lied to us unless they had a perfectly good reason to do so. I joined the Army Security Agency (ASA) in 1963, attended the Russian program at the Defense Language Institute in Monterey,Calif., and was stationed just outside of Washington, D.C., at ASA Field Station No. 1 at Vint Hills Farm, Va., for my spook training. It was at Vint Hills Farm where they told us our jobs would violate international treaties -- a necessity to protect the security of the United States. It also was at Vint Hill Farms where I was introduced to a sophisticated piece of American technology. It was a radio provided by the NSA that could receive an exceptionally narrow bandwidth signal in the FM range. Attached circuit boards allowed it to decode the signal as it was received. Our code name for the system was "Mercury Grass." The Soviets didn't know we had the technology, which was good. That exceptionally narrow bandwidth FM signal was how the Third Shock Army commanders communicated with	Moscow. They didn't believe we knew about their new coded signal. They didn't believe we could detect it. And they believed that if we did find out about it and did intercept it, it would take us weeks to break the code. Instead, whenever a field officer would talk secretly with his commanders in Moscow, an American spook would be listening in. Of course if the Soviets ever found out about this secret spy program, it would become useless. We also used less sophisticated radios to listen in on what the tank companies were doing. In case of an actual war, that would become our sole mission. We would monitor the tank units, plot their locations, block their communications and even slip in false messages. But the NSA wasn't interested in any of that tactical information. It was interested in the "Mercury Grass" strategic product and any civilian Russian radio messages we intercepted. I got out of the service in 1967, but kept in touch with a few friends for a few years. One was from Massachusetts. He eventually made a career out of the Army and saw a lot of changes in how our old job got done, and some of those are relevant today. Spying on electronic communications was getting more sophisticated even back in the closing days of the Cold War. There were fewer radio operators needed than before. The NSA was designing equipment that would seek out designated words and then automatically record that portion of the conversation. The ASA merged with Army Intelligence in 1977 into the U.S. Army Intelligence and Security Command (INSCOM), but military units still shared their high-level intelligence with the NSA. The mission continued to change for my friend. By the end of his career, he said monitoring radio and telephone signals for the Army still resembled our old job, but the work for the NSA was done totally by arcane, automated equipment. It's my understanding that's how things are being done today, as the NSA's secret mission is being disclosed for the world. It's automated equipment is programmed to seek out certain "hot" words. Only then do the recorders come on and only then does it draw the attention of a human operator. The question I've heard posed on TV news and in newspapers is does the president have the authority to direct the NSA to spy on Americans without a warrant? The question, itself, is designed to anger you and make you feel violated. It would be fairer to ask: Does the president have the authority to direct the NSA to pursue foreign terrorist links when they lead to locations within the United States without seeking new warrants? We have laws that prevent the police from entering your home without a court-issued warrant. However, if a police officer is chasing a robbery suspect, who climbs through an open window at your house, the policeman isn't required to sit down and await a warrant. "In hot pursuit" allows the officer to enter your home without a warrant and protect you and your family. That's what the NSA is doing. Critics say the president should take these cases to the FISA court, designed specifically to grant warrants for overseas surveillance. But the FISA court still demands "reasonable cause" before issuing a warrant. And the president believes that limitation could cost several thousand Americans their lives in the case of an imminent terrorist attack. "Reasonable cause" isn't an impossible standard to reach. But all of these cases would fall short. These are phone numbers, names, email addresses found in suspected or known terrorists' address books or computers. And "association" frequently isn't sufficient for "reasonable cause." A stateside telephone number found on a captured terrorist laptop computer, might be for a pizza parlor in Boston. Or it might be for a deranged mullah waiting for the terrorist to bring him a biological agent. That's the point of this. The phone numbers could be very important, but just as likely aren't. There will be no evidence to provide "reasonable cause" unless the NSA listens in. And as soon as the terrorists learn that these phone numbers and email addresses have been compromised, they will stop using them (except to order pizza). The information is valuable for a very brief time. If the NSA uses this information only to thwart terrorist attacks, there is no violation of the Constitution. However, if the NSA discovers other non-terrorist crimes under the program, and shares that information with enforcement agencies, that would be a clear violation of civil liberties. Like "Mercury Grass" was effective only as long as it was a secret, so too was this monitoring program effective only as long as the terrorists didn't know about it. Now they know better than to trust the public air waves with non-coded messages. Our civil liberties never were threatened -- or at least there's been no evidence presented that the program was used for anything other than protecting national security. But now this effective method of monitoring what terrorists may be doing within the United States has been leaked -- it's effectiveness irrevocably damaged; our intelligence gathering limited. We are in greater jeopardy now than we were before The New York Times published the story. Critics want an investigation of presidential abuses, as they demanded an investigation of who leaked Valerie Plame's name to the media. Too bad they are not as concerned about who leaked this NSA program to the Times and actually damaged our nation's security in the process. I returned to 14 Sigs from the German Interpreter Course at Higher Education Centre, Mülheim an der Ruhr at the end of March 1990. I knew as soon as I arrived at Celle, that the Regiment’s character had changed since I left in 1985. I arrived at the guardroom just before 1 pm to collect the key to my new married quarter. Just in time, as the SSO bloke was just leaving. “Thought you were never coming“he said. I replied that I had handed over my quarter in Mülheim that morning and as far as I was aware, Friday was still a working day. “We knock off at one on Fridays,“ he said handing me the key, and disappeared. (Funny, even at Mülheim we had worked till 4 o’ clock). But that arrival was to be symptomatic for my stay in Celle. For a start, the world had changed since 1985. The Berlin Wall had been breached in November 1989, and the talks preparing for the Reunification of Germany were well underway. I found the quarter and then drove off to Hannover to pick up Ingrid, who had travelled up by train. We marched in to the new quarter, a terraced house on the edge of	Celle. In the row behind us I was greeted by an old friend, Jim “Pot“ Black, who I was relieving. Over a beer he filled me in on Celle and the available jobs. The trouble was, that no-one knew what would be happening to the Regiment, and that we were expecting some sort of decision to be made on our fate. Rumours were rife. Langeleben was still operating as an outstation, the operators were bussed down for 24-hour shifts. As the fate of the WGF was also uncertain, we could only guess what would happen next. At any rate, the military situation was relaxed. This, of course, meant that the military side of things was now much to the fore, and the 14th Signal Regiment, which up to 1985 had prided itself on it’s professionalism in it’s unique task, now resembled a normal line Divisional Signal Regiment. We in HQ Squadron carried out normal military training. I was now one of the two W.Os who were the Regimental Duty Reporting Officers, in “normal” times this would have been an interesting job, we took it in turns a week at a time to be on call. I read the reports from other NATO sources and added it all to the reports from Langeleben. Other WOs ran the language training cell. We were in charge of a Major in the Int. Corps, who was the Regimental Int. Officer, the S2. Assisting him was a couple of Int. Corps W.OIs. The beautiful old medieval town centre, good shopping facilities and the natural beauty of the surrounding Lüneburg Heath made Celle a good place to be stationed. The town was home to two British units, us at Taunton Barracks and north of the River Aller, the Fusiliers at Trenchard Barracks. The Bundeswehr was also well-represented, so soldiers were a common sight in the streets. Facilities for the soldiers and their families were excellent, a new NAAFI shopping centre had been built, the cinema was still in the middle of town. We could receive British Forces Television, as well. Ingrid liked Celle, she quickly found a job in the kitchens of the Fire Brigade School. 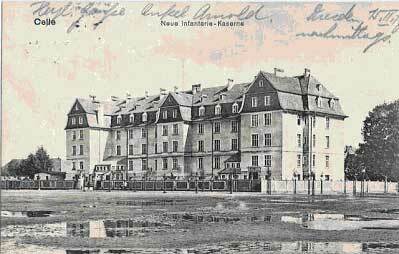 After a few weeks I was told that I would be going down to Langeleben for a week, as the R Signals WO1 was deployed on exercise, and they needed someone who could speak German to look after the place!! After the move of 1 Squadron to Celle in March 1985 Langeleben had become “Field Station Langeleben”, a training unit. The setroom was manned by operators from 1 and 2 Squadrons at Celle, being bussed down for 24 hour shifts. Five permanent staff remained to administer the camp. In charge was a R Signals WO1. Operations were overseen by an Int Corps Staff Sergeant. A Signals SQMS looked after the stores. The workshop was run by a technician Sergeant and a Catering Corps Lance-Corporal looked after the food. The civilian staff had also been reduced. Ilona Hawxwell ran the mess, which was used as an all-ranks facility now, the shift operators dined in the old Sergeants’ Mess and the permanent staff and senior ranks ate in the old Officers’ side. One waitress had been retained, Frau Wirtsch, the “white tornado”. Renate Ellis and her son Trevor assisted the cook. The MSOs from the guardroom had now been replaced by Germans. Gardener Freddy Bubolz looked after the camp’s appearance. Two civilian drivers completed the staff. I spent a pleasant week in the old camp, which was being well cared-for. I spent some time in the set room, listening to what activity there was, mainly low-level field training. The atmosphere was one of boredom, though. In the evenings I either sat in front of the television (we now had a satellite dish installed on the roof of the mess), or went into town for a drink. I returned to Celle with a heavy heart, back to the round of Regimental Duties and Training Days. I took part in the Colonel’s Cup competition, I completed the course, but it was very uncomfortable for me and I limped in as my foot was very painful. These were the first signs of my trouble with gout, though I didn’t know it at the time. In June the Regiment deployed into the field; the Regimental Command Post went down to Langeleben. As there was not much activity going we sat around in the RCP Int wagon trying to look busy when the CO looked in. The preparations for German Reunification proceeded apace, on 1st July the currency reform took effect; the GDR now had the Deutschmark. We now had a date for Reunification, the 3rd October, although we were still in the dark as to the future of the Regiment. But Fate had other things for us in store. On 2nd August Saddam Hussein invaded Kuwait. I went on a couple of weeks leave with Ingrid to Berchtesgaden. We stayed in the American Armed Forces Hotel General Walker on the Obersalzberg, and did some hill walking and sightseeing, even going on a day trip to Venice. When we returned, we found that the British Army was deploying 7th Armoured Brigade to Saudi Arabia. A small EW liaison team would accompany them; we gave them what working aids we thought they might need. My old pal Bob Crockart as a WO1 EW Op was part of the team. I wished him all the best, and said I hoped we would see them back soon, waved them goodbye and I returned gloomily to my desk. Then the Int Officer called for me. He surprised me by asking if I would like to go to Langeleben to join the permanent staff. Ted Roberts, the Int Corps Ssgt was due posting, and a replacement was required. I didn’t need long to think about it, I thought that I could do as much at Langy as I was doing at Celle, so I said yes. Ingrid had to give up her job at the Fire Brigade School, but was glad to return to near home. I was allocated a Married Quarter in Wolfenbüttel, a couple of doors down from the Langy SQMS, Pete Rixon. Then permission to visit the GDR was announced, I had to notify the security section of my intentions in advance, but now there were no border controls. One Saturday we drove over into the GDR and did a round tour, all familiar names: Gardelegen, Stendal, Tangerhütte, Colbitz, Hillersleben. Near Mahlwinkel there was what appeared to be a car boot sale going on, directly outside the gates of the barracks. We stopped the car and had a look around; there were dozens of Russian soldiers buying up mainly electrical equipment, radios, shavers, Walkmen etc. Now they were paid in Deutschmarks, they were stocking up on stuff to take with them back to the USSR. In Letzlingen we stopped off for coffee and cakes, before returning over the old border. An interesting day. But just before we departed for Langeleben there was a special occasion, to which we had been invited. The Intelligence Corps in Germany had organised a dinner in Berlin, ostensibly to welcome the new Corps RSM, but also to celebrate the end of an era, as the Cold War was rapidly coming to a close. In the event, I drove up with Geoff Williams and his family from Celle, and we were accommodated in Edinburgh House. Geoff had never been to Berlin before and I took the opportunity to show him round the sights. I took great pleasure in taking the Underground to Friedrichsstrasse Station (in the East) and walking down the Unter den Linden and out through the Brandenburg Gate. A year before they would have shot me. The dinner was a great success, in the Berlin Garrison Sergeants’ Mess, and most of 3 Sqn, 13 Sigs were there, along with other old friends, including the Corps RSM, who I had shared a room with as Corporals at Cheltenham in 1976. It was almost like an Int Corps celebration dinner for the end of the Cold War. There were lots of apologies for absence, as it was now becoming obvious that the crisis in Kuwait was not going to go away and many people in the Corps were being warned to standby. I started work at Langeleben on the 14th October. Operations in the set room were now down to normal working hours, 0800 to 1600, Monday to Friday. John Sinden was the WO1 i/c and he showed me round the camp. 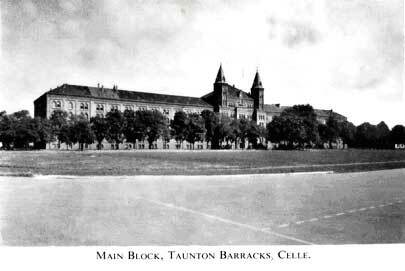 All the old accommodation blocks, plus NAAFII, cookhouse and gymnasium had now been rented by the US Army from Wobeck. It must be remembered that the Dollar had been falling for several years, and even the Yanks were feeling the pinch. Being paid in Dollars, they were at the mercy of the volatile exchange rate. (The British fared better, we were paid in Deutschmarks at a fixed exchange rate, which only changed if Sterling fell beyond a certain limit over a set time). The Americans from Wobeck lived very comfortably (when the Dollar was high) in the Deutsches Haus in Schöningen, but now they were looking for a cheaper alternative, and had found Langeleben. The contract had been signed, and they had brought some furniture and stuff and dumped it in the NAAFI. But that was as far as it went, and in the event they were overtaken by Reunification, otherwise the camp would today have been full of Uncle Sam’s finest. 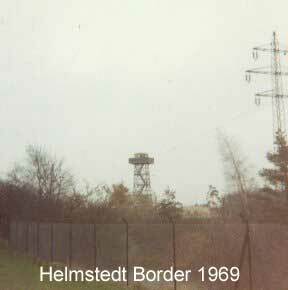 The third tower was undergoing work to strengthen it; the plan was that a big reception/transmission antenna would be mounted on top, which would automatically relay the intercept back to a new set room in the ops block in Celle. This was due to come into operation in 1995, but of course the operation was soon cancelled. We travelled down to Wolfenbüttel to say hello to the Queen’s Dragoon Guards, and we had a drink in the Sgts’ Mess. The QDGs were due to leave Wolfenbüttel, but the departure had been delayed as they had been obliged to provide a Squadron for the Persian Gulf. In the Mess I met their Master Chef, who I had known as a Cook Corporal in Berlin, and we had a beer or two as we mulled over times past. It was, of course, a problem to keep ourselves busy. An atmosphere of boredom hung over the camp, no decisions on the future of the Regiment had been taken, everything was on hold as the crisis in the Middle East deepened. Then the British Government announced that a second Brigade (6th Armoured) would be sent to the Gulf. This meant that a Divisional headquarters would be sent to command the two brigades. 1st Armoured Division HQ from Verden was chosen, and the division would take an EW Squadron under command. The news galvanised the Regiment into action, and the CO’s choice fell on 2 Squadron. In the event, to put one fully-manned squadron into the field needed just about every operator in the Regiment, so few missed out on the trip. There was a problem with vehicles, we only had soft-skinned one-tonne rovers, and the powers that be decided that we should be armoured. In no time at all a fleet of AFV 432s was produced, which were then converted by the radio technicians and REME LAD into two intercept troops. We reported to Celle at the beginning of December for pre-deployment training, a week on the training area brushing-up on weapon training, fitness training, first aid, Geneva Convention, AFV recognition etc. I was having problems with my foot (gout!) but I gritted my teeth and got through the PT sessions. At the end of the training we returned to Langy to make preparations for departure, the date of which had still not been announced. We hoped that we would at least be able to enjoy Christmas at home. We locked up the Ops Block and Setroom. The military cook and the technician Sergeant had been withdrawn to Celle. The plan for Langeleben was that a Sergeant from the QM’s department would come down from Celle daily and look after the camp. In the event, the civilian staff continued on working without any problems. On Christmas Eve we received the dates of our flights to the Gulf. I was lucky, my flight was on the 2nd January, so I got Christmas and New Year at home. We celebrated at home in Wolfenbüttel, as I was determined not to let my impending departure overshadow our enjoyment. On New Year’s Day I drove up to Langy and parked my car up in the MT, removed the wheels and put a dust cover over it. I walked round the camp and said farewell to the guards and returned to Wolfenbüttel. The next day early Reinhard Heine, the civvy driver, picked me and my kit up and drove me to Celle, where I joined the others who were travelling with me. We drew our weapons, picked up the classified boxes and had some inoculations. Then we boarded the bus for Hannover Airportand we were off to war….. The flight back from Dhahran landed at Hannover early in the morning, I had slept all the way. Our kit was laid out on the runway, I was one of the first to find everything and walked across to the waiting bus. In the dark, a figure sat on the first seat, as I clambered up the steps he jumped up and grasped my hand, “Welcome back, Mr. Richardson”, he said. It was the CO, and he had met every flight carrying members of the Regiment back from the Gulf. We drove off to Celle, where we handed in our weapons and were issued leave passes. A car was waiting to take me and John Sinden back to our quarters in Braunschweig and Wolfenbüttel. We had two weeks leave, but first I had to retrieve my car. Before I could drive, though, I needed insurance, as I had cancelled mine for the duration of the war. 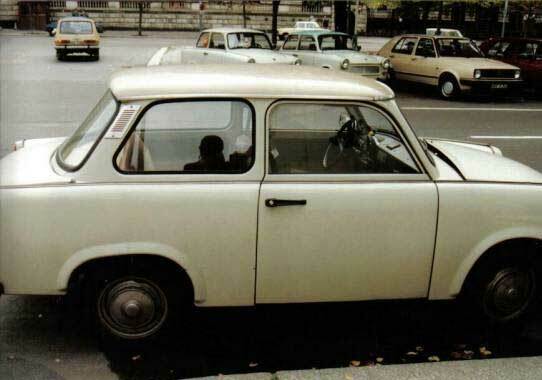 I now had to take a train to Celle NAAFI insurance services to pick up a green card, then return to Königslutter and a taxi up to Langeleben to put the wheels back on the car. It was a sunny day when I returned, and the camp looked in pristine condition. The lawns had been mown, the paintwork touched-up, the buildings were clean and looked-after. The guards on the gate greeted me like a long-lost friend. It was good to be back. We organised a “welcome back” party in the NCOs’ mess in the German barracks in Braunschweig. The Sindens, Ingrid and I, with Bob and Cath Crockart were guests of honour, John and Ingrid Sands came down from Celle and we had a good night. The welcome among the Germans was also very good, Wolfenbüttel and Celle with their British connections were very proud of “their” Tommies. The town of Wolfenbüttel wanted to put on a “thank you” parade, but the Queen’s Dragoon Guards went straight off on leave, and when they returned they were packing up to leave, so declined the offer. The Celle Town Council made a similar offer to 14 Sigs, but the CO turned it down. He said that did not want to offend the feelings of those unfortunates (including the CO) who had not deployed to the Gulf. After leave, we returned to Langy. The camp was looking good, but now the set room was permanently closed, the daily operations were a thing of the past. The Russians were proceeding with their withdrawal from the former GDR and only carried out low-level training to keep the troops busy. The CO decreed that Langeleben should be used by Squadrons for whatever training they desired. This meant that they came down for a week of training, which maybe included manning the set room. The rest of the time the troops went for runs, or carried out some deployments on to the German training area near Cremlingen. The permanent staff carried on as best they could. The Americans up the road at Wobeck were now preparing to leave; they collected their furniture which had been standing in the old NAAFI. We had a lunch together in Schöningen, and talked about our activities in the Gulf. In Wolfenbüttel a new regiment arrived, the 13/18 Hussars. We had assumed that the QDGs would be the last cavalry regiment in Wolf, but surprisingly for them as well, the programmed handover/takeover took place. The !3/18 were very friendly and always made a point of inviting us to their dinners. 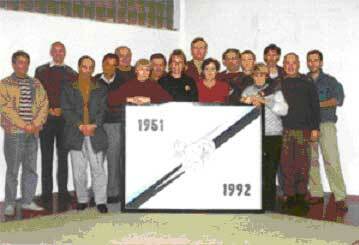 How long they would stay was also not clear at this time, in the event they left for Hohne in September 1992. With the end of the Gulf War, the British Government’s Defence Review “Options for Change” was now revealed. In the event the Treasury gleefully seized on the opportunity to drastically cut the Armed Forces, a policy which in the light of later events appeared very short sighted. Anyway, the uncertainty pervaded the atmosphere throughout the summer and autumn of 1991. Large-scale field manoeuvres were no longer being held in BAOR, instead Corps and Divisional Headquarters carried out Command Post Exercises (CPX) for which the Regiment provided EW inputs and staffs. We took our turn in deploying out with the Divisions, but it became clear that we were only marking time as the scenarios being enacted were still of the Cold War. In June we did what was a first for us. I got a phone call from the Int Cell, it was my old pal Paul “Bert” Lancaster. He asked me what my French was like, I said it was a bit rusty, but would hold up. To my surprise he said that we were sending an EW team to join a French EW unit on exercise. Paul picked me up in Wolfenbüttel and we drove in two Land Rovers through Germany to Alsace, had where we met up with the French troops and our officers. As France not participated militarily in NATO since 1966 this was an indication of how the World was changing, even at our low level. We spent a pleasant week in France, a visit to Metz, plus the quality of food was good and the extended lunches with vin rouge were a novelty. “No chance of us getting medals here, Bert,” I said, “Why do you say that?” he asked, - “I don’t think they’ll be able to find an officer who would be willing to kiss Plug*!”. On the work side it was interesting to see their EW equipment. At the end of the week we said our farewells, and loaded up with cases of wine and cheese we headed back to Germany. 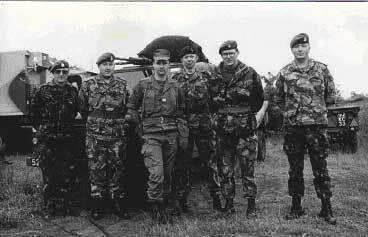 Later that year we had a reciprocal visit from two French Warrant Officers to Langeleben. Their visit coincided with a deployment by one of our Squadrons, and at the same time a US EW unit was operating from Langy. The Yanks had obviously been warned about the presence of the French and studiously avoided them whenever they met them. It was funny to see the bar on an evening packed with British and Americans whooping it up, yet when the Frogs came in the Yanks withdrew to their own side of the bar. The long-awaited “Options for Change” was announced in December 1991. BAOR would reduce to one Division in Germany (4 Div at Herford would become 1(UK)Div) and would form part of the new NATO Rapid Reaction Corps. 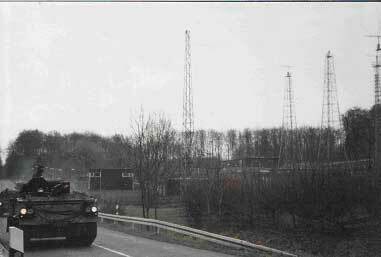 As part of the reorganisation, 14 Signal Regiment (EW) would leave Celle and relocate to Osnabrück in early 1993. 13 Signal Regiment would be disbanded. The 13/18thHussars would amalgamate in 1992 with the 15/19th Hussars to form the Light Dragoons. At least now we knew roughly what was coming. A wave of redundancies was announced (but not for Int Corps or R Signals) and some of the tankies got horrendous sums for signing off. One day the CO turned up, accompanied by the Commander Comms, 1 (BR) Corps, Brigadier Taylor, who had been a Squadron Commander of mine in Berlin. They looked round the camp, and ended up in the set room. They conferred with us, and the Brigadier said to the CO, “Well, you can close when you want”, and the CO said “Good, then give it up to the end of November.” And so the closure was settled. 1992 arrived and we knew what was in store for us. Life in the sleepy hollow called Langeleben continued, the Squadrons came down from Celle to do their training, and we assisted them where we could, organising trips to the riot police in Braunschweig, booking training areas from the Bundeswehr, arranging trips to the swimming baths in Schöningen. Otherwise we spent much time on the golf course at Braunschweig. Now and again we visited the Regiment in Celle to show face. We said goodbye to the Americans from Wobeck at a ceremony in Schöningen, knowing that our time was also running out. The British Forces’ School at Wolfenbüttel sent a class up for a week; they held nature rambles and visited the quarry outside Königslutter to search for fossils. One day they were visited by a class of White Russian kids, who were visiting Germany as part of the “Children of Chernobyl” scheme, which offered free holidays for children who had been affected by the nuclear disaster. As Russian speakers, John Sinden and I assisted at the party. They were served fish and chips and I doled out cans of Coca-Cola. After a while I noticed that the Russian kids were not opening their cans, and asked why, and was told that they wanted to take them home with them, to show the folks. So I said drink up, and presented them with a stack of cases to take with them. Their teachers had never seen plastic knives and forks, it just shows what we take for granted, so Billy, the SQMS, gave them a few bags-full from the stores. There was a lot of singing and so on, the Russian kids were all very underdeveloped through radiation sickness. We also donated all our spare compo rations from the QM’s stores. The Regiment came down to us in force for the first week of Exercise “Sweaty Palm”. This was an escape and evasion exercise over two weeks. The first week the troops were instructed in survival techniques before being let out for a fifty-mile evasion run in the Sauerland. Hunting them were a battalion of infantry with dogs and helicopters. The exercise ended with them being “interrogated” by the experts from Ashford. All members of the Regiment had to go through this at some time. I was feeling a bit low; my mother had just died after a long fight with cancer. My gout was giving me jip, and our future seemed uncertain. I spoke to our personnel branch, but they couldn’t say anything regarding future career moves. I took a month’s leave and we travelled to Canada to visit relations before heading for the sun in Florida. The break did me good and when we returned I sat down with John Sinden and Billy Corner to discuss the closure. Then the Regiment was honoured by a visit from the Royal Signals Colonel-in-Chief, the Princess Royal. She apparently wanted to thank the Regiment for it’s efforts in the Persian Gulf, so the Langy permanent staff with wives drove up to have tea with the Princess. She arrived in a bad mood, as the leading car of her convoy had had an accident on the way down from Hohne. However, her mood improved as she toured the barracks. The armoured intercept 432s roared onto the square - driven by both Signals and I Corps - screeched to a halt in front of the Princess and the crews somersaulted out of the wagons to form up in front of the panzers. After lunch in the officers’ mess, she toured the ops block and then met up with the WOs and Sergeants for tea. She made a very down-to-earth impression as she chatted to us. I don’t think Ingrid washed her hand for weeks afterwards. Back at the ranch, we decided to have a farewell jamboree, trying to contact as many old comrades as possible. I wrote letters to the newspapers in Cheltenham, Taunton, Scarborough and Loughborough; put adverts on Channel 4’s teletext, in the “Wire”, and contacted BFBS radio. The event would be self-financing, the CO loaned us some money as working capital. The CO of the 13/18th Hussars kindly offered us the use of his Band. Wolters’ Brewery assured us of their assistance, (as one of it’s best customers over the years!) Slowly the event assumed shape and the letters of acceptance began to arrive. We asked for reminiscences of people’s time at Langeleben, with the object of producing a small programme for the celebration. It soon became obvious that some old comrades’ memories were like elephants and with a bit of filling-in, we had a near-complete chronology of the camp. A member of the original probe section of 101 Wireless Troop sent in his recollections, and our President remembered carrying out the recce. The late Sid Grimshaw produced a detailed study of life in Langeleben in 1955. The actual weekend was a huge success, covering three days. We timed it to coincide with the Schützenfest in Königslutter, so that we did not have to organise too many events. Well over two hundred former inmates attended, being accommodated both in camp or in the town. The Farewell to Langeleben week-end started on the Friday with an “open day” in the camp, winding up with the Beating of Retreat by the Band of the 13/18th Hussars and the lowering of the flag for the last time. The Burgomaster of Königslutter and General Baldwin took the salute. In the evening we had a dinner in the “Lutterspring” Gaststätte, with music provided by the Band again and a comedian for after-dinner entertainment. On the Saturday, led by General Baldwin, we marched through the town as part of the Schützenfest procession. In the early evening we held a Service of Thanksgiving in the Kaiserdom. The Band provided the music, and the service was conducted by Pastor Trümer and the Regiment’s Chaplain, Padre W. The CO of the Regiment, Col. Hope, and the Burgomaster read the lessons. After the service the majority of the troops retired to the Schützenfest beer tent. On the Sunday many reappeared for the “Hangover Breakfast” in the tent. After the weekend we started to pack up what was left of the furniture. The bar was dismantled and carried off by 1 Squadron for their new Squadron bar in Osnabrück. The Lelm volunteer Fire brigade gladly took all the crockery. The local school’s English department was presented with all our library books. I shredded what was left of classified documents and gave the set room “Snide Books” to the Unit Security Officer for safe keeping. John Sinden departed for the UK for his last six months in the Army, so only Billy Corner, as SQMS and I were left. I was still singing with the Braunschweig Police Choir, and every Autumn they gave a concert in the Braunschweig Stadthalle. As part of the preparations, they held a weekend of rehearsals to give the final touch to the repertoire. That year we went to the Youth Hostel in the town of Uslar, on the River Weser, not far from Göttingen. During a pause between rehearsals, I was talking to the Conductor, and he mentioned that he had seen something in the local newspaper, which said that the Wolfenbüttel Garrison (which included Langeleben) would be closing in November. Did that mean that I would be leaving? he asked. I said that I would probably be moving to Osnabrück around that time. I thought nothing more about the conversation until a couple of weeks later, one of the choir approached me and said that there was a job going in the CID headquarters in Braunschweig, and would I be interested? At the time I still had about four years to serve, but the uncertainty and the boredom, plus the gout made me think seriously about taking up the offer. Ingrid was, of course, happy to stay on her native heath, so there was no problem there. At the end of the German interpretership, I had, however, been obliged to sign a form preventing me from leaving the Army until three years after completion of the course. I wrote to the MoD but they refused to release me from the contract. I then asked for an interview with the Regiment’s CO, and, to cut a long story short, being the gentleman he was, we worked out a way to satisfy both parties. So I started working half days in Braunschweig and spending the other half in Langeleben. We held a small party for the Civil Labour, the Regimental 2IC came down and made a speech, and then the civvies presented Billy and me with a small keepsake. Over the next couple of weeks a procession of visitors from the Property Services Agency (PSA), HQ 1(BR) Corps and Helmstedt District Council came and looked round the camp, which was still in very good condition. The council was planning to put asylum seekers into the accommodation. And so the final day came, as the representatives of PSA and Bielefeld, the QM from Celle assembled to hand over the camp to the District Council. The keys were handed over and we had our photos taken in front of the gates. Then we shook hands, got into our cars and drove off. That was the end of Langeleben as a camp, but the spirit lives on in our hearts. Although the Squadron had left LANGELEBEN, it was still obliged to man the setroom on a full 24-hour basis, with operators being bussed down from Celle to complete a 24-hour shift. The Squadron was a regular visitor to Langy, when it carried out deployments for training. In addition, other armies' units found the location ideal for their own deployments, including Americans (both from Germany and the US, Danes, Germans and French. Many friendships were sealed during and after these visits. The beginning of the end of LANGELEBEN can be dated from 9 October 1989, when the Berlin Wall was breached and the Inner German Border opened. Those who lived through it will never forget the events of those autumn days. Königslutter, being so close to the border was quickly swamped by droves of 'Trabbis'. Supermarkets were swiftly emptied of stocks, and the euphoria of the Reunification gradually evaporated as the town reeled under the weight of the mob of pushing, gawping strangers in their evil smelling puddle-jumpers. Another old Cold War veteran disappeared in early 1991 - the British Military Train, which had travelled daily between Braunschweig and Berlin since 1945. Under the terms of the Reunification Treaty, all Soviet troops were to be out of the former GDR by 1995. This was taken by the permanent staff at Langeleben as confirmation of what they had long suspected that the closure of langy, at least in its present form, was imminent. Operations in the setroom were reduced to normal working hours, Monday to Friday. Throughout BAOR exercises had been reduced to a minimum following the reduction in tension in. The British Government introduced a review of defence commitments called 'Options for Change'. With the Options for Change decisions being put into effect, the axe finally fell in February 1992, when the closure date for Langeleben Camp was announced as 30 November 1992. A feeling of sadness was felt by all who had been connected with the camp and remembered the good times that they had had there. In the days of the Cold War the 3rd Shock Army was the Soviet formation that sat on the other side of the IGB. They were ‘The Bad Guys’, the Soviet hordes and we at Langeleben were there to hold them back with just a little bit of help from the rest of BAOR. Proof, if ever it were required that "Quality was better than quantity, but then, quantity has a quality all of its own". One British Corps versus one Soviet Army never seemed quite a fair contest but the Russians must have seen something in our presence that we never appreciated or we mis-interpreted their intentions. 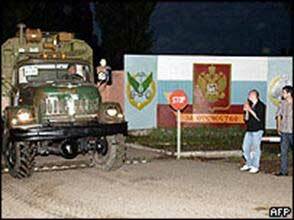 Apart from the Soviet Military Mission, Soviet troops never crossed the border! From 1945-1954, the Soviet forces based in Germany were known as the’ Group of Soviet Occupation Troops’. From 1954-1989, they were designated the’ Group of Soviet Forces in Germany and from 1989-1994 they were known as the ‘Western Group of Troops’. This force comprised the strongest Soviet military concentration outside of the national borders of the USSR. By the late 1980s, the Group of Soviet Forces in Germany/Western Group of Troops totalled over 380,000 troops and consisted of the 1st Guards Tank Army, the 2nd Guards Tank Army, the 3rd Shock Army, the 8th Guards Army, the 20th Guards Army and the 16th Air Army. The organization of Soviet armies was different from that of Western armies, which can lead to some confusion and exaggerate the seeming imbalance. The basic large unit was the Army, of which there were three types: infantry, tank and shock. They tended to be smaller than Western armies — an infantry army usually controlled 4-8 rifle divisions, with 6 being average. The Corps had been abolished as an echelon of command in 1941 (primarily due to lack of trained commanders and staff), so that divisions were controlled directly by the army headquarters. (The WWII Tank Corps, Mechanized Corps and Cavalry Corps were actually division-size units.) Thus the Army was intermediate in size between the Western corps and army. The next echelon of command was the Front, similar to the Western army group. The ‘Shock Army’ originated in 1942 and, at first, it was a temporary grouping. An ordinary infantry Army would be reinforced with extra artillery and tank units to make the initial breakthrough in an attack, after which a Tank Army would exploit the breach. Thus "shock" = "assault". By 1944, the organization of the Shock Army had been regularized and one was assigned to each active Front. The 3rd Shock Army remained on the postwar establishment and was part of the Soviet Army Group of Forces in East Germany until the end of the Cold War. Special titles that were given to Soviet armies included 'Red Banner', following the award of the ‘Order of the Red Banner’ and 'Shock'. 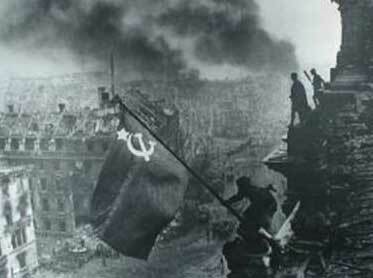 The famous image of the flag over the Reichstag was of forces from 3rd Shock Army. The 1st Shock Army, formed, in accordance with pre-war planning that saw Shock Armies as special penetration formations, was in November-December 1941 to spearhead the counter-offensive north of Moscow in December. A total of five shock armies were formed by the winter campaigns of 1942-3 - the 2nd (former 26th Army), 3rd, and 4th (the former 27th Army) - During the Stalingrad counter-offensive the 5th Shock Army was the last such formation to be formed. The 2nd Shock Army was re-formed three times, most famously after being encircled in the Liuban' operation south of Leningrad, after which its commander, General Andrey Vlasov, went over to the German side. Armies which distinguished themselves in combat during the Great Patriotic War of 1941- 1945 (our 2nd World War 1939-1945) often became Guards Armies. These included the 8th Guards Army. 47. army (headquarter Halle) · 77. rifle corps (185., 260., 328. rifle division) · 125. rifle corps (60., 76., 175. rifle division) · 129. rifle corps (82., 132., 143. rifle division) 1st Guards Tank Corps and the 25th Tank Corps. These troops had the theoretical task of implementing the Potsdam Agreements. In real terms though, they represented the politico-military interests of the Soviet Union. In 1957 an agreement between the governments Soviet Union and the GDR laid out the arrangements over the temporary stay of Soviet armed forces on the territory of the GDR, the numerical strength of the Soviet troops, their assigned posts and their exercise areas. 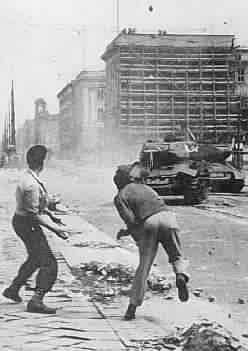 It was specified that the Soviet armed forces were not to interfere into the internal affairs of the GDR, which however they were to do later during the Uprising of 1953 in East Germany. 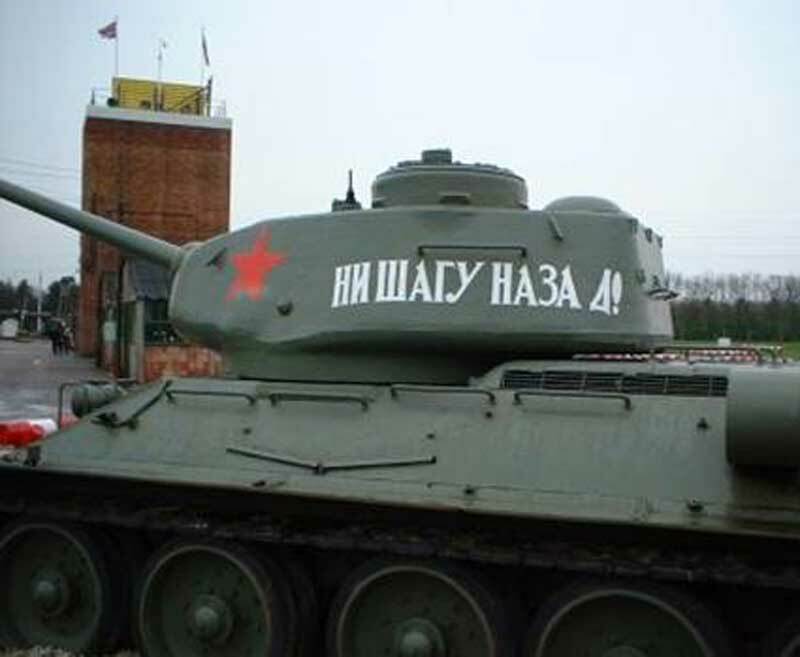 Following a resolution during by the Government of the USSR in 1979/80 20,000 army personnel, 1,000 tanks and a lot of equipment were withdrawn from the GDR. During Perestroika, the GSFG was realigned as a more defensive force as far as strength, structure and equipment were concerned. This involved a clear reduction of the tank forces in 1989 . The withdrawal of the GSFG was one of the largest troop transfers in peacetime military history. Despite the difficulties, which resulted from the dissolution of the Soviet Union in the same period, the departure was carried out according to plan and punctually until August 1994. The departure of the troops and material took place mainly by sea via the ports in Rostock and the island of Ruegen as well as via Poland. The Russian Ground Forces said ‘Farewell’ on 25 June 1994 with a military parade of the 6th Guards Motor Rifle Brigade in Berlin. The parting celebrations in Wuensdorf on 11 June 1994 and in the Treptower park in Berlin on 31 August 1994 marked the end of Soviet military occupation and operational readiness on German soil. The 18th Guards Army was withdrawn from Germany to the Belarussian Military District in 1979 and later disbanded. Thanks to Orbat.com and Retrieved from "http://www.arrse.co.uk/wiki/3rd_Shock_Army"